“System change, not climate change! The newspapers may speak of financial and economic crises, but when we look around ourselves, we don’t see derivates and financial markets – what we see is the destruction of communities, of our social and natural environments, of our relations to each other. What we see is capitalism destroying us. Against this destruction, and the austerity that follows in its wake, people are resisting, people are fighting back, people are beginning to create the new worlds we know to be necessary: from Ghana to Greece, from Copenhagen to Cochabamba, from Bangkok to Brussels. 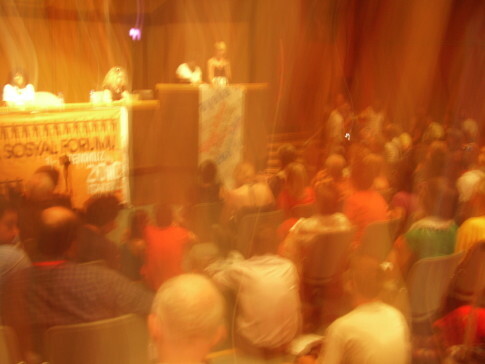 We from climate and social justice movements gathered at the European Social Forum in Istanbul, are a part of and inspired by these global processes of resistance and creation, but also realise that we need to fight where we stand: to create another world, we also need to create another Europe and tear down the walls of the fortress that surround it. Against those who try to create divisions between social and ecological justice, we assert that they do not contradict each other. They are and have to be complementary. Our vision is of a good life for all, not a nightmare of authoritarian eco-austerity. Against those who oppose people’s desire to have good and well-paid jobs and to move beyond the madness of infinite growth on a finite planet, we are calling for a just transition in the way we work, in the structures of production and consumption. While there are many things we need more of, there is much we need less of. For example, we need to stop the destructive energy production practices involving coal, oil, nuclear and hydropower, or to end the madness of building individual cars for everybody. At the same time, we need to expand community-controlled renewable energies, food sovereignty as well as public services that contribute to our goal of a good life for all, like free public transport, health, housing and education. This would create millions of socially and ecologically useful jobs. This is what we mean by just transition, by climate justice: it does not mean having the ‘right’ position on what is being negotiated at UN-climate summits. It’s not about parts per million of carbon in the atmosphere. Although it is important to change our individual behaviours, climate justice is about fundamentally changing our model of production and consumption of food, goods, energy, of our entire lives. It is about finally making amends for the ecological debt we owe the rest of the world.